JB Turner of Front Street Shipyard said company officials are excited about a new 30-foot high-performance patrol boat craftsmen there will make for Newport, RI-based Trefoil Marine. Workers at Front Street Shipyard put some final touches on a Deer Isle yacht inside one of the company's buildings on the Belfast waterfront. The shipyard is so full right now that officials may have to rent space elsewhere in order to build a number of high-performance patrol boats. 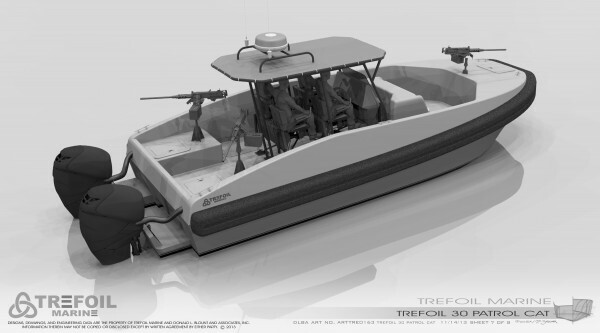 The Front Street Shipyard soon will commence building high-performance catamaran patrol boats for Trefoil Marine. The fiberglass T30s will have a foam collar and can be customized to include features such as gun mounts and inboard diesel or twin outboard engines. BELFAST, Maine — The protected coves of the Pine Tree State have a storied history as the place to build elegant, traditional wooden sailing ships such as sloops and schooners. At Front Street Shipyard in Belfast, a different kind of vessel soon will be taking shape: a high-performance catamaran patrol boat, complete with mounts at the bow where long-range weapons can be installed. The T30 boats, designed by a Virginia firm, are being constructed for Toronto- and Newport, R.I.-based Trefoil Marine. The first patrol boats should be rolled out of the shipyard this spring, with their ultimate destinations located all over the world. He declined to put a price tag on the boats, which will be built of fiberglass poured into a composite mold that will be constructed this month by the Belfast shipyard’s composites team. According to Mattingly, the 30-foot patrol boats will include a $35,000 electronics package, and that’s just part of what will make them pricey. “People would look at the price and say, ‘They’re out of their mind,’ but that’s the price they go for,” he said. The T30 will be zippy and customizable, reaching speeds of 50 knots, or 57 miles per hour. In the first year, Mattingly hopes to build between 20 and 25 of the patrol boats at the Belfast shipyard. He and J.B. Turner, president of the shipyard, are enthusiastic proponents of the new boat-building venture, which Mattingly said is a continuation of a long relationship among the various company principals. While Trefoil was incorporated just a couple of years ago, Mattingly has been in the industry for nearly five decades. 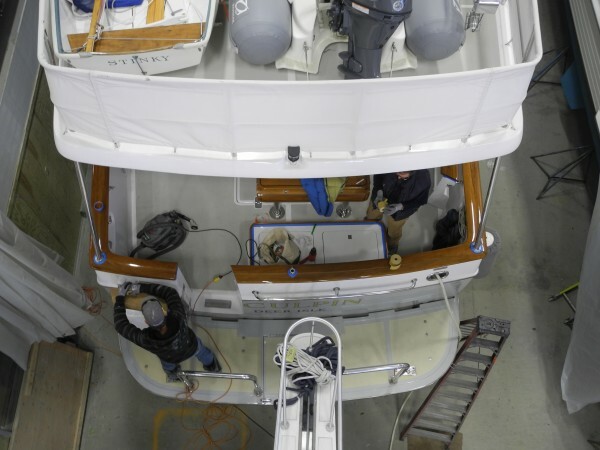 While Trefoil Marine previously had boats built in New York, Connecticut, Florida and Wisconsin, the company now has an exclusive partnership with Front Street Shipyard. Besides the T30, Trefoil Marine also has contracted with the shipyard to build three water taxis and a 45-foot limousine boat for use in the 2015 Pan American Games in Toronto. “We will keep the yard busy for quite some time,” Mattingly said. “I could see us hiring 10 or 12 people if these take off,” he said. Once the shipyard has the fiberglass boat molds constructed, workers will use them to build many more of the boats. The first batch of completed vessels will go to private security companies, which will install the guns or other armaments, Mattingly said. The model also can be customized as a fire boat, or could be used for police, military or rescue purposes. It’s designed for river and shallow-water operations as well as use on the high seas. If the T30 takes off, the shipyard will have to creatively find enough space to build them, and that might mean production of the models will leave Belfast, according to Turner. Mattingly said that he’s been pleased with how the project has started.